Muehe, D. Brazilian coastal vulnerability to climate change. Pan-American Journal of Aquatic Sciences, 5(2): 173-183. Download PDF file (524 Kb). Nicolodi, J. L. & Petermann, R. M. Potential vulnerability of the Brazilian coastal zone in its environmental, social, and technological aspects. Pan-American Journal of Aquatic Sciences, 5(2): 184-204. Download PDF file (5,896 Kb). Faraco, L. F. D., Andriguetto-Filho, J. M. & Lana, P. C. A methodology for assessing the vulnerability of mangroves and fisherfolk to climate change. Pan-American Journal of Aquatic Sciences, 5(2): 205-223. Download PDF file (385 Kb). Le�o, Z. M. A. N., Kikuchi, R. K. P., Oliveira, M. D. M. & Vasconcellos, V. Status of Eastern Brazilian coral reefs in time of climate changes. Pan-American Journal of Aquatic Sciences, 5(2): 224-235. Download PDF file (315 Kb). Ciotti, �. M., Garcia, C. A. E. & Jorge, D. S. F. Temporal and meridional variability of Satellite-estimates of surface chlorophyll concentration over the Brazilian continental shelf. Pan-American Journal of Aquatic Sciences, 5(2): 236-253. Download PDF file (361 Kb). Hirata, F. E., M�ller Jr., O. O. & Mata, M. M. Regime shifts, trends and interannual variations of water level in Mirim Lagoon, southern Brazil. Pan-American Journal of Aquatic Sciences, 5(2): 254-266. Download PDF file (1,483 Kb). Muehe, D., Belligotti, F. M., Lins-de-Barros, F. M., Oliveira, J. F. & Maia, L. F. P. G. Potential vulnerability to climate change of the beach-dune system of the Per� coastal plain - Cabo Frio, Rio de Janeiro state, Brazil. Pan-American Journal of Aquatic Sciences, 5(2): 267-276. Download PDF file (1,029 Kb). Machado, A. A., Calliari, L. J., Melo, E. & Klein, A. H. F. Historical assessment of extreme coastal sea state conditions in southern Brazil and their relation to erosion episodes. Pan-American Journal of Aquatic Sciences, 5(2): 277-286. Download PDF file (8,042 Kb). Medeanic, S. & Corr�a, I. C. S. Climatic changes in the coastal plain of the Rio Grande do Sul state in the Holocene: palynomorph evidences. Pan-American Journal of Aquatic Sciences, 5(2): 287-297. Download PDF file (1,515 Kb). Hellebrandt, D. & Hellebrandt, L. Representations in the Brazilian media of the impacts of climate change in the coastal zone. Pan-American Journal of Aquatic Sciences, 5(2): 298-309. Download PDF file (710 Kb). Gherardi, D. F. M., Paes, E. T., Soares, H. C., Pezzi, L. P. & Kayano, M. T. Differences between spatial patterns of climate variability and large marine ecosystems in the western South Atlantic. Pan-American Journal of Aquatic Sciences, 5(2): 310-319. Download PDF file (427 Kb). Schroeder, F. A. & Castello, J. P. An essay on the potential effects of climate change on fisheries in Patos Lagoon, Brazil. Pan-American Journal of Aquatic Sciences, 5(2): 320-330. Download PDF file (839 Kb). Lemos, A. T. & Ghisolfi, R. D. Long-term mean sea level measurements along the Brazilian coast: a preliminary assessment. Pan-American Journal of Aquatic Sciences, 5(2): 331-340. Download PDF file (230 Kb). Costa, M. B. S. F., Mallmann, D. L. B., Pontes, P. M. & Araujo, M. Vulnerability and impacts related to the rising sea level in the Metropolitan Center of Recife, Northeast Brazil. Pan-American Journal of Aquatic Sciences, 5(2): 341-349. Download PDF file (659 Kb). Faveri, D., Scherner, F., Farias, J., Oliveira, E. C. & Horta, P. A. Temporal changes in the seaweed flora in Southern Brazil and its potential causes. Pan-American Journal of Aquatic Sciences, 5(2): 350-358. Download PDF file (259 Kb). Rio Grande Declaration. 1st Brazilian Workshop on Climate Changes in Coastal Zones: Current Knowledge and recommendations. 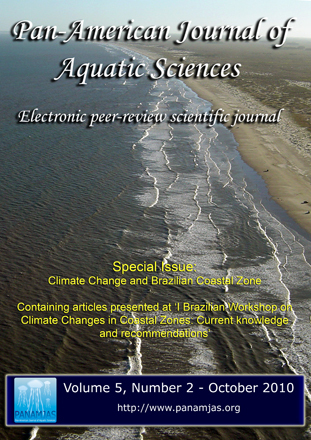 Pan-American Journal of Aquatic Sciences, 5(2): XII-XV. Download PDF file (89 Kb).